Pearl Classical Dressage – Tea bags and horse hair. Now that the weekend is over, the horse and trailer have been returned to their respective farms, and the human thoroughly napped and fed dinner, time for a clinic recap! This weekend Fidelia and I rode in three lessons with Spanish Riding School Bereiter, Florian Bacher. 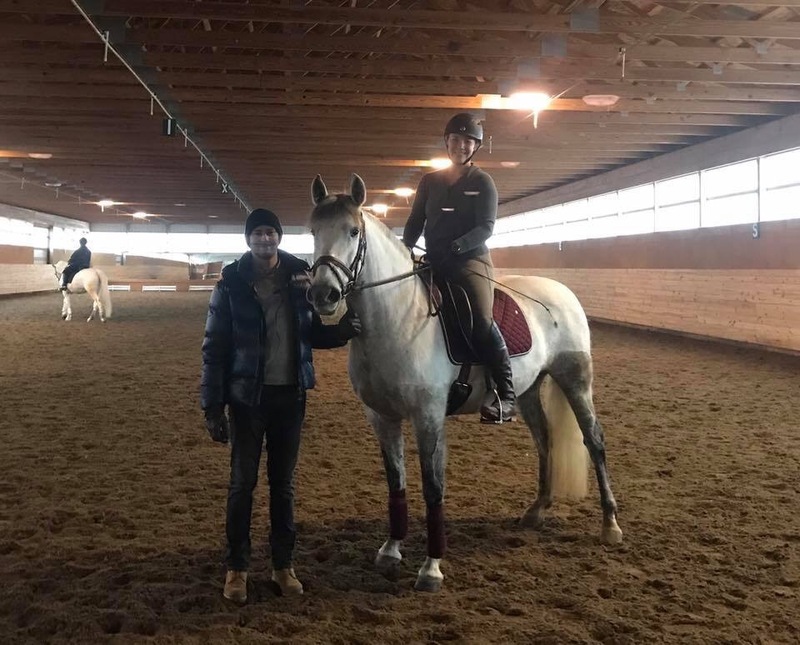 I have ridden with him before with my client’s western dressage horse, Jazz, and I was looking forward for the instruction I’ve become addicted to in the last decade. Faith and I have struggled since she bucked me off before Thanksgiving. 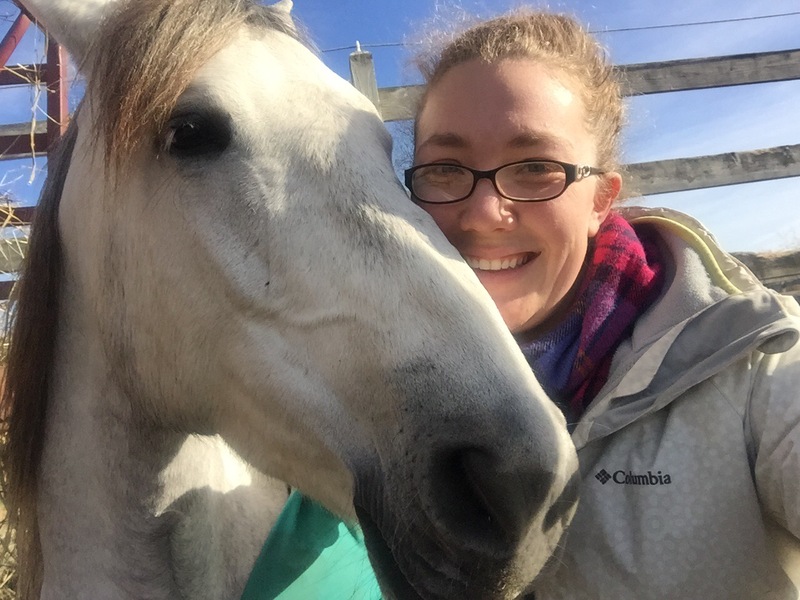 We had a great ride with Becky Knollman shortly after that helped my confidence a little, but then between weather and teaching extra and holidays and being sick, well, my horse is the typical Cobbler’s Child. So, that little seed of hesitation grew into a little sprout, which soon turned into a stupid, thorny vine of fear that twisted all through my brain. I felt stuck and frustrated and knew Faith felt the same. We arrived at the beautiful Summerwood Equestrian Center on Friday and had a great schooling session. 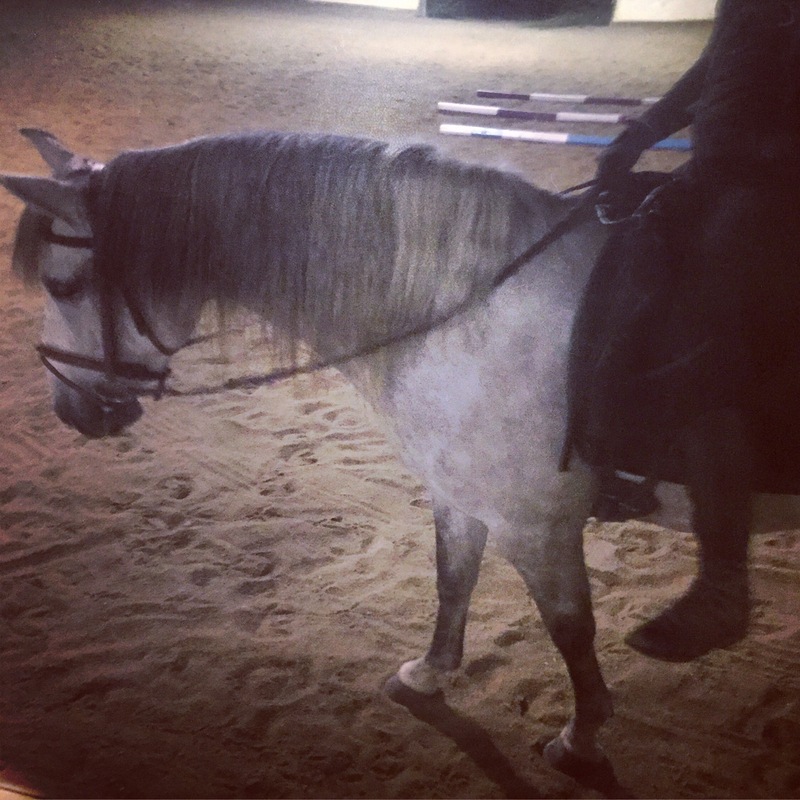 Like I said in some of her really early posts, she gets lateral like a gaited horse when she is super tense. Unfortunately that popped back up the last two rides before the clinic, so knew we were super off “the good path”. But, still, her head was in the game and that made me super excited for our rides. Saturday rolled around and I was quite nervous. “My goal is to not get bucked off or throw up,” I joked with my mom. We started out our warm up with all four on the floor, but wow it was tense and icky. I was trying to keep her tempo slower so I could get a better connection like we had worked on with Becky, but spicy pants was not really having it. Florian had us ride really forward until she relaxed through her back and then worked with my seat to slow the tempo. My girl needed to accept the leg into the hand better. I needed to relax basically my entire body and actually ride my horse instead of perching up there like a defensive pigeon (my words, not his haha). Oh, did I mention also keeping it together in sitting trot? Eek, I haven’t been working on that with her, so it was a nice challenge for both of us. It felt like a hot mess, but looking back it wasn’t as bad as it felt. Less than halfway through the lesson and we were both getting more confident and relaxed. We walked, trotted, and cantered and achieved a pretty decent degree of back to front connection. By the end, I felt like I had my horse back, the horse I fell in love with four years ago as a youngster. Hurray! Days One, Two, and Three in order from L to R.
Sunday’s lesson started out better quality than I had achieved by the end of the first, so it was promising that the second lesson would be even better. I made a great game plan in my head and set a few riding position goals for myself to ensure I was riding my best for her. Legs on, relaxed seat, quiet hands. I felt more confident and she felt phenomenonal! It’s so amazing to have my beauty girl rise to the occasion. Set that bar high and watch her go! We worked on more of the same but with so much less tension to begin with that we had much better connection so worked on more cantering in both directions with good success. She is so fine tuned and responsive off my aids that we had some super work in all gaits. Saturday cemented the principles and feeling more in my head. New goals for Day Three: no pulling, (not even a smidge), more consistent legs on, quicker connection into the bridle. Today’s lesson was the best yet. I feel like Faith and I made a complete 180° from where we started in Friday, and I no longer feel any fear or anxiety when I get on. She is confident, relaxed, and so willing to work. I am confident, relaxed, and with a great plan of action to take her training forward. 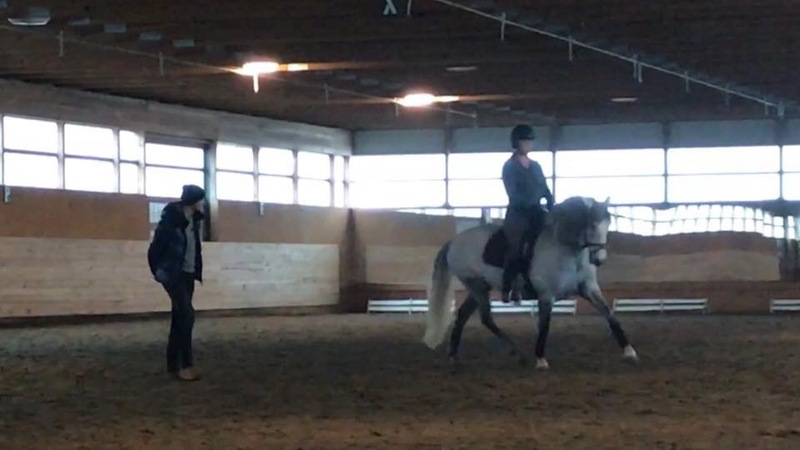 We worked on more connecting in the trot and then, since she was very accepting of my leg so quickly at the beginning, got to work sooner in slightly more collected work. (Collection being a relative term in comparison to the nicely forward trot I use to get her in front of the leg and through her body). We worked on a 10m circle at trot and canter and also did some leg yielding to a larger circle at the trot. Working on level-appropriate collection in the sitting trot, day three. You guys. My horse knocked my socks off today. Remember that bar? Set it high and she rises to it every single time. I am absolutely on Cloud 9 with how much we accomplished this weekend. I feel absolutely confident with her again and know we are on a good path to success. I got so many compliments on her (including being asked if Marius helped me pick her out!) Faith is such a special horse to work with. Our partnership has grown another big leap this weekend, showing me again and again how sensitive and willing she is to work. I can’t wait to develop her slowly and correctly so she can blossom as an FEI horse someday. Again, a huge thank you to everyone who made this possible! Florian for his time away from home, teaching in the US. Jorie for organizing the clinic, Teah and Summerwood Equestrian Center for hosting, Janice for letting us use her trailer. My mom and Laurie for driving down for support, Rachel for your friendship, grooming, and videoing. My awesome sponsors and companies I am delighted to support: Equus Couture, FreeMotion Equine Massage, County Saddlery, and Grand Meadows Supplements. Without this village of support, I would be nowhere! I promised you an update last night but true to form, it’s now Wednesday night and I still haven’t written part two! This update is the other half of my happiness and truthfully, I don’t know which part makes me more happy. Monday was Faith’s follow up appointment with Dr. Thaler. We were prepared to do a second lameness exam using their lameness locators and then anticipating needing to block and x-ray the right front as well as make a plan to address the other issues at hand. Here is a link to the post regarding the first appointment. I am BEYOND blessed to say that Faith shows a FULL recovery. I’m not kidding, I nearly cried for a second time in 24 hours. Sweet girl and I having a snuggle while she napped in the sunshine. She showed no sensitivity in her right front and no lameness when flexed. She has more coordination, leading them to not feel the need to neuro test her by the tail pull or tight circles. I forgot to say in the initial post, but she had some muscle sensitivity that could have been an early sign of PSSM or EPM, but no trace of it has remained. She flexed sound on both hinds as well. Overall, Dr. Thaler was very, very happy with her progress. I opted to have her stifles injected as every once in a while she will have an almost gaited horse rhythm walk between walk and trot, although Atlas also did that when his stifles needed injecting too and it’s almost a non-existent problem anymore. We chose to do the hocks too to make sure she is 100%, absolutely in perfect condition to move forward. I’m not anticipating that either of those injections will be more than a yearly thing, if that at all. We also received a huge compliment from Dr. Thaler and Bonnie, who said that they really could see our partnership and how much we were a wonderful pair, that we are really meant to be together. Knowing them and coupled with the fact that they have only seen Faith twice ever for her appointments, this means SO much. My good friend, Kathryn, who has worked with them for years, said they don’t hand out compliments, especially like those, lightly!! There really aren’t words to describe how I’m feeling after this 3-day weekend. I don’t know which update I’m more excited about. It makes me so unbelievably relieved that she isn’t in pain or dealing with chronic inflammation issues that will eventually hinder her work or struggling with neurological issues or facing progressive breathing problems. I am equally thrilled that she is back to being my sweet, willing mare and is 100% mentally ready to progress. Plus add in the excitement of Becky’s “stamp of approval” and the opportunity to ride with her more often down in Ohio, I’m like, about to explode from excitement! I have so much to be thankful for this Thanksgiving. Wishing you and your favorite equines the same! Ahhh, ’tis the season for thankfulness and today I am filled to the brim, maybe even overflowing with thankfulness!! Let’s begin with a recap of the last month with Faith. She got body clipped, which helped keep her nice and cool as we enjoyed the last of the beautiful fall weather (and now it’s freezing!) She has been gaining strength and losing weight, although we still have a ways to go toward our goal. She has also bucked me off when we were feeling a bit fresh in the outdoor (she hasn’t done that again since then haha). This weekend, we rode with Becky Knollman, a fantastic instructor from Ohio. Atlas and I had great breakthroughs with her, feeling on the edge of greatness right before he passed away. Having that ripped away so suddenly is still such a sore point in my emotions, but I am feeling more at peace lately with what has been developing with Faith. Our first ride was a little tough, not because Faith was bad, but Becky is a wonderfully demanding instructor (much like Marius). Each instructor has a different set of exercises, expressions, ways of explaining, and way they want you to ride your horse. Having been out of lessons since I came home from Vienna, it was a little abrupt adjustment but we found our groove a few minutes in. We worked a lot on containing Faith’s energy, making her more true in the contact, and straighter in between my aids (being a sensitive horse, she likes to ping pong around). By the end of my ride, I felt like I was on a different horse!! She was still forward and in front of my leg, but controllable and adjustable and more confident in the contact. I got a bit lost in my training tree, concentrating too much on being in front of the leg that we just were pinging around the arena, not really accomplishing that much (other than not letting her buck me off). I needed to be more confident and assertive in the contact and not fall into the trap of letting her move my aids around, instead of setting the parameters for her to work in. She has enough strength that working on contact that is appropriate for her training level (so not compressing the neck/back or forcing her into a degree of collection she isn’t ready for) is not only not inappropriate for her, but it is also the very necessary jump in training that we need to take to keep continuing up the training tree. I think one of the most exciting things is that even when I raised the bar of my expectations, I never once got any resistance, snark, or attitude. Faith was with me, willing to work the entire time, and that is almost more satisfying than anything else. Sunday’s warm up was already such a difference from Saturday’s. Faith and I both had a better understanding of how Becky wanted us to work and I felt like I could at least emulate it a bit. We worked on the same things, obviously: steady in the contact, straight between left and right aids, no twisting of the head or neck, and consistent tempo. Faith was more than willing to work and again, I felt NO resistance to what was asked of her. Here is another super, ridiculously exciting bit: Becky loves her. 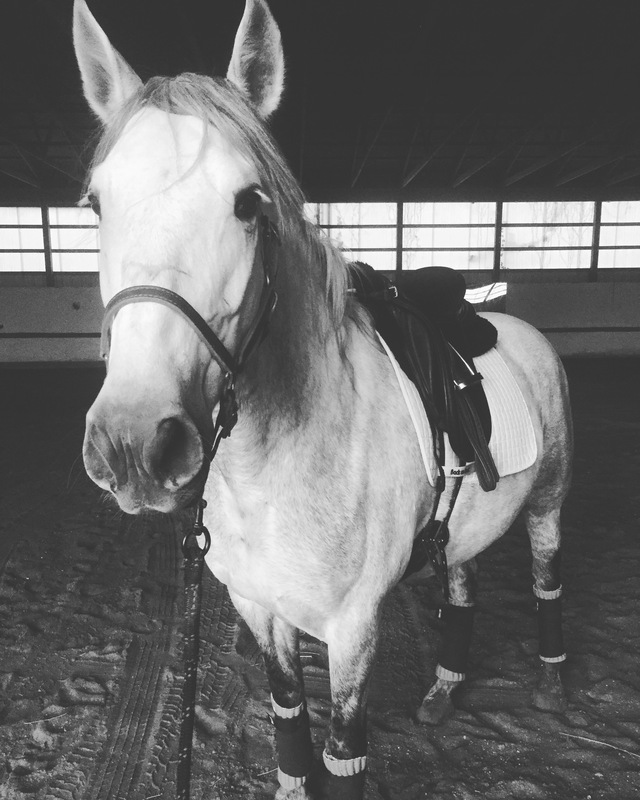 Loves her gaits, loves her attitude, loves her ability to extend and collect. She said many times this weekend that she is extremely talented, is going to be a piaffe and passage machine, and is going to be a great first horse for me to train through FEI levels. Yeah, are you as excited as I am?! I was positively geeking out. Becky said that she will bring her in-hand whip and bamboo pole and we will start working on the intro to piaffe and passage in January at the next clinic. Combined with her praise of how talented Faith is, how much I am thankful for what Atlas has taught me, and that Faith is mine, I dissolved into the happiest tears. So there’s Part One of Thankful Tuesday. I have to dash off to teach, so will be writing up the next part later tonight. I have been away from the barn for almost a week due to getting my wisdom teeth removed last Thursday. While I still don’t feel 100%, today was the first day back riding. 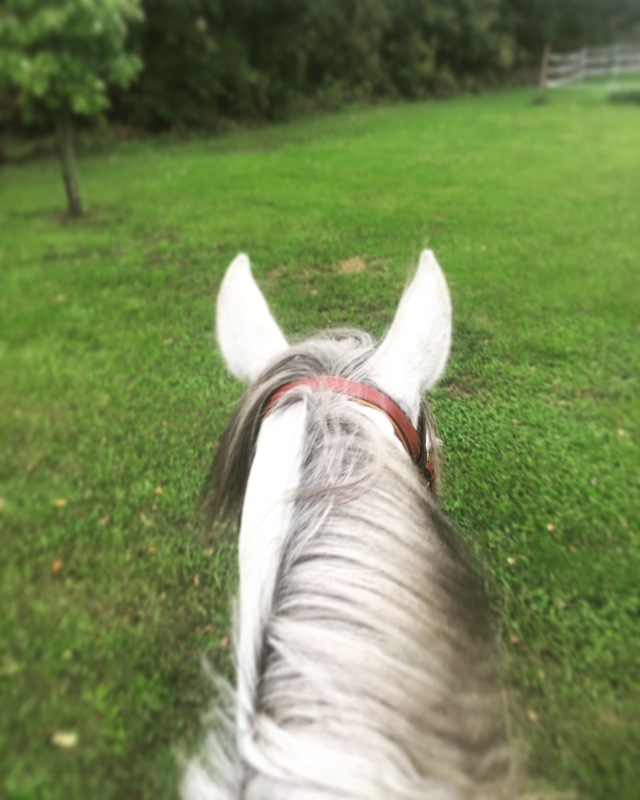 I want to brag a little about how awesome the Little Grey Mare is doing! We are closing in one the end of week four that she has been at Three Fillies Farm (officially arrived four weeks ago Wednesday night) and we are so much farther along in training “schedule” than I originally anticipated! I had written up a schedule that had us only longing and doing ground work these last 3.5 weeks and doing our first ride at the end of this week. Yeah, psh, it was a glorious dream but I’m too anxious about getting her going. Also, she hasn’t once told me she is in pain or can’t do what I’m asking, so there’s that too. If she had, I’d have happily (or maybe unhappily) stuck to my plan. Tonight I hopped on after just some ground work, no longing, because I wanted to test how she felt and how she’d react without “diluting” it with longing. Just like my plan, you can always go backwards if it doesn’t feel right. I also took our “training wheels” of the horsemanship flag away tonight, wanting to see how that would influence our ride. It didn’t, she was just as superb with the dressage whip, which I tapped once but otherwise just held. Since she now understands forward is good, I’m trying to focus on quality over the baby horse quantity of forward work. I started to make sure that I only asked for upward transitions tonight when her back was relaxed and swinging and that she had to start the idea of being a tad straighter. But wait, you’ll say if you’re a dressage purist like myself, straightness doesn’t come until at least a few more levels on the training pyramid. That’s true, and I’m only talking about straightness in the way that she is accepting of my leg aids and moving away. Rhythm is still a bit dicey through the walk-trot transition particularly when she wants to be very tense through the back, but it’s getting slowly better too. I think that’s primarily a result of her tenderness in the right front and left stifle. Excited to go to Dr. Thaler on Monday. Overall, I’m really pleased with our ride. She had one moment of slight naughtiness when she was annoyed that she had to stay in the trot instead of going to the canter (I know, the horror!) And Charlie was mowing right around the indoor arena as I was riding, so she had her little Spicy feet on with lots of knee action. 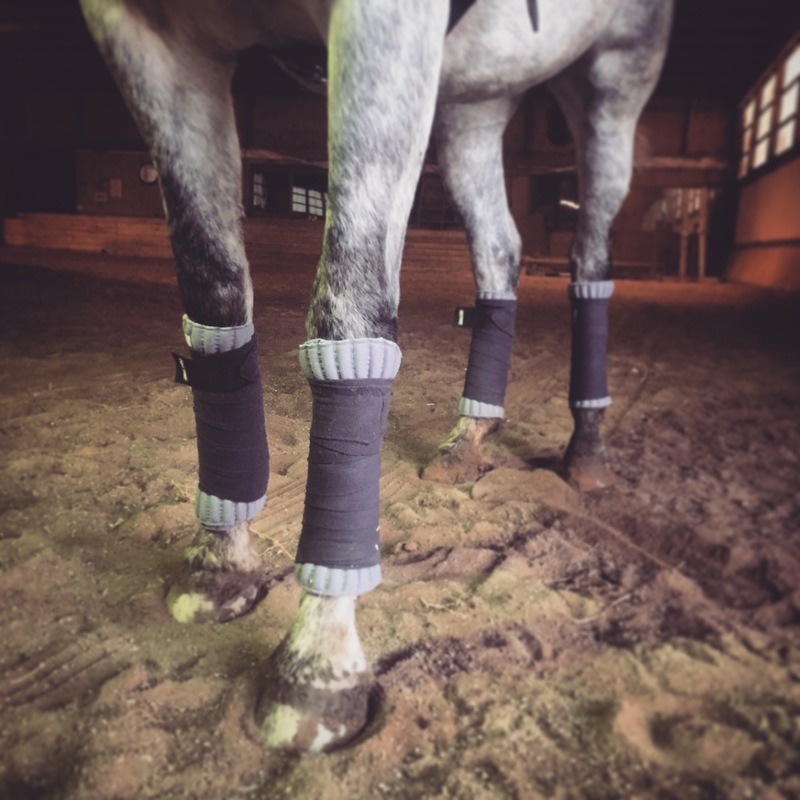 Fidelia got to wear the “grown up” wraps tonight (my Austrian Eskadron bandage liners and favorite grey polos). I feel more and more like I have my horse back in the mental sense of that statement. She is very tuned in to my body language and aids (seriously, her downward transitions are achieved just by breathing out), and I feel less and less resistance to working. She feels happy and spunky like her old self, which makes me SO HAPPY! She is such a special horse and our bond has been strong since the beginning. I’m so happy to have her back in my life! To the woman who felt the need to bully me in a Facebook group on Thursday after my friend recommended me to someone looking for a dressage instructor, I have a few things I want to get off my chest. You probably won’t read this, as I blocked you and think you probably did likewise, but like after Atlas’s passing, it feels really good to write it all down. You attacked me indirectly when my best friend suggested my name as a dressage instructor willing to travel. I don’t know you, have never even heard your name in passing, and honestly hope that I never do get to meet you face to face. Your words were hurtful and your attitude damaging in our sport. You based your entire judgement based on my show record on Centerline Scores, which only shows USDF shows. It has a few scores on there at Training, First Level, and the FEI Four Year Old test I rode with Fidelia two years ago. It doesn’t show my tests with Razzle or Gideon because we chose to show them in the Opportunity Classes to save money getting exposure for sales horses. It doesn’t tell you that Atlas came along last minute at his last show in 2015 when my client’s horse went lame the week of the show. Based on that meager information, you deemed my worth inadequate and called me a fraud, a nobody who feeds lies to my clients and steals their money. You dragged me through the mud, saying you have better scores on crappier horses than I do on my “purpose bred warmbloods” and you hoped I was a “recent immigrant” so it would account for my lack of show scores in the U.S.. It wasn’t that part that was hurtful, although the immigrant comment made my laugh – that was a new one. Centerline Scores doesn’t show my involvement with the United States Pony Club (B graduate) with scores at Second Level from rally, or the Woodbine shows with Jazz where I showed in Western Dressage, or Nibbles in her first show where she felt more like a kite than a horse, or sweet Mia, who got great compliments from Sue Hughes, someone we both have worked with and hold in high regard. I don’t care what you think of my limited show record because I’ve never been a super competitive person. I have always scrimped and saved to choose a couple of horse events every summer and, for the last 10 years, chose clinics and lessons over horse shows. I will choose a clinic over a horse show every time. It’s the reason why I’ve ridden almost exclusively with Spanish Riding School Bereiters for ten years, why I’ve driven hours every time they are here to ride wherever they are, and why I’ve spent as much as a normal person does on college to spend six collective months there to study dressage in private lessons on leased horses. Charly, who I rode in 2012, was a sweet older gelding who helped my goals of learning flying changes and taking my lessons entirely in German into reality. I was an amateur then, I hadn’t even made the jump to professional. Delano and Bologna, the horses I rode this year, are owned by a Bereiter’s wife, and are two of the most sensitive, challenging, and rewarding horses I’ve ridden. I got to start learning piaffe, passage, and pirouettes with Delano, which was the most incredible experience. I have never once claimed to be an FEI rider or advertised lessons above my knowledge level. I have the best riders in the world as my idols and mentors: the Spanish Riding School bereiters. Compared to the Bereiters, who are my friends, not just acquaintances, I feel like I am that Joe Schmo and will feel like that until the day I become one of them, riding in the Hofburg itself on a Lipizzaner stallion. You can’t surprise me with criticism about my riding level when I so readily feel like an ant next to these giant. But most importantly, I want you to know the reason I spent a good portion of Thursday night sobbing on the couch after reading your comments. It’s not because your words were that hurtful, but because I miss my best friend. I miss Atlas so much I can’t breathe at times. It’s been just over seven months since we lost him to colic, and last month was the final payment on a five figure bill from MSU. We lost him after eleven years of partnership together, eleven years of training and loving and becoming one. That horse, that wonderful big fuzzy mammoth horse of mine who loved bananas and cinnamon Altoids, I swear he could read my mind. He loved half passes and got unbelievably nervous about flying changes. We had just started working with Becky Knollman, an amazing instructor from Ohio, and my nineteen year old horse never felt more on top of his game. I was so excited for once to head into show season. 2016 was going to be the year I got my bronze medal. But in an instant, that all changed. A softball sized tumor ripped my world apart on Leap Day and I’m still putting the pieces back together seven months later. I’m not a top tier professional with a bunch of horses in my pipeline, I’m just a young professional whose horse was my soulmate and world. Without him, I’m struggling. I’m struggling to find a horse I can trust to use in lessons, a horse I can pony Fidelia off of around the trails to help her lose weight and gain muscle to see if she is sound, a horse I can use so I can commit to clinics with to further my education, struggling to find my feet in a world turned upside down, just to name a few things. If love could have saved him, he’d be immortal. The funny part about this whole thing, what you say is valid: clients should want an instructor worth traveling to or paying high dollar for. Your complaint that any Joe Schmo off the street can call themselves a trainer is one I lament frequently. I wish that the U.S. had a great certification process like Europe does. Do you know that it is actually a life goal of mine to get a system like that in place? You wouldn’t, because you don’t know me! There are so many other ways a “little fish” trainer like me can be useful to the grass roots of our sport. A good teacher is like a dressage horse, developed over time. Pushing the little trainers who are dedicated to quality receiving and passing on education out of the sport is only harmful to the sport as a whole. So I’m going to continue to do me, and you continue to do you. I’m going to continue to place my focus on the highest quality education, chipping away at someday becoming an FEI rider, and in return teaching my students the same principles of my beloved Spanish Riding School. 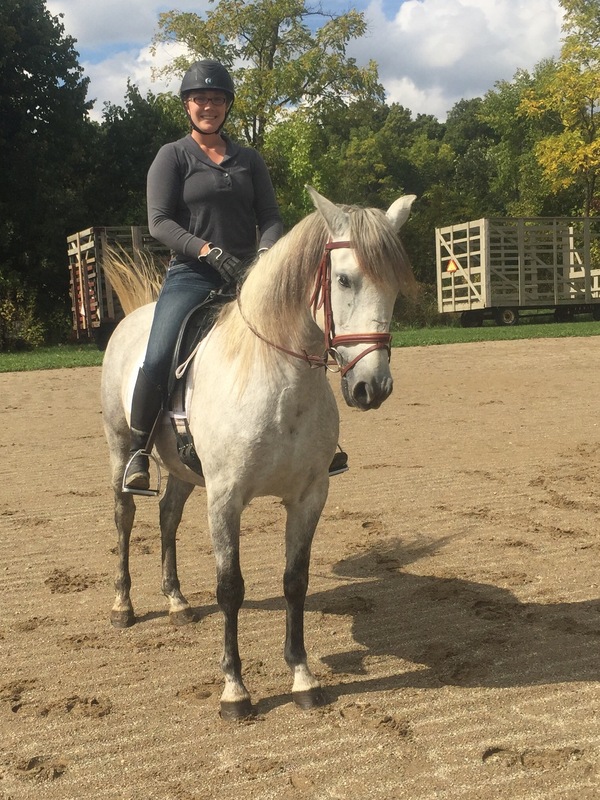 I’ll continue to offer my services to the clients who want to build a relationship of trust and respect with their horse, to learn to become the best riders they can be, no matter if their aspirations are to ride down centerline or down the trail. Scroll down to the bottom of this post for video! 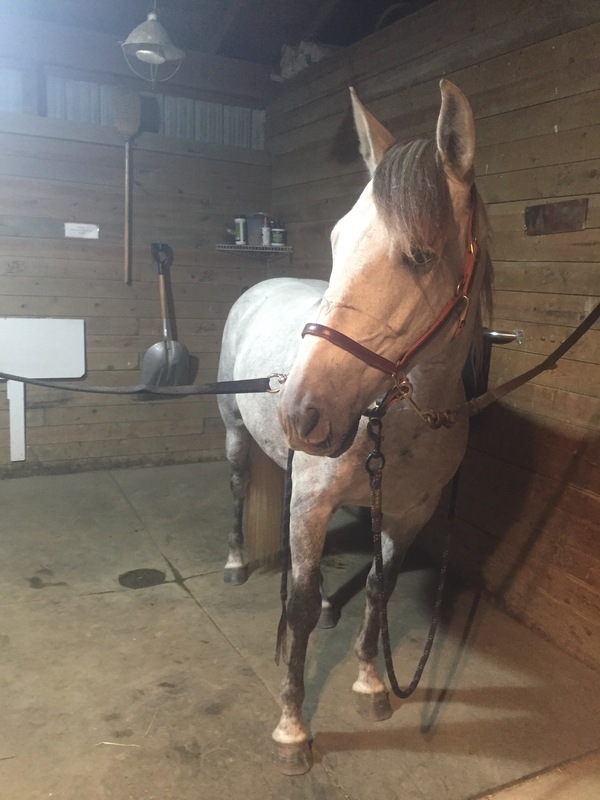 Little Grey Mare had her first appointment yesterday with Equine Sports Medicine specialized vet, Dr. Roland Thaler of Metamora Equine PC.I think this will be one of a series of appointments until we diagnose and treat whatever is going wrong with her. She had a lameness exam done using their EL2 Lameness Locator, which uses three sensors to measure the impact and push off of each limb, plus other things and analyzes the findings into a nifty graph. It is an amazing way to measure lameness as it takes away the subjective “so and so classified it as a 3” when the other vet said she was a 2, etc. I love my baby horse. She was so well behaved for the appointment for arriving just minutes before at a new farm. Back, neck, and SI joint/hips all had normal palpation and flexion and deemed clear. So, a lot of things that we didn’t expect to be the issue have cropped up, but nothing right now is career ending. Neurological or breathing issues are my main concern and perhaps that’s not the right way to think about it, but there have been so many advancements in lameness treatment/management that her right front/left hind needing an injection don’t scare me as much as that used to. Faith has another appointment with Dr. Thaler on 10/24 to reevaluate and then move forward with blocking/x-rays of the right front plus whatever else needs to be done. Personally, I think that her breathing is just a significant lack of cardio stamina. He said I am to go ahead and push her a little these next few weeks to get her cardio built up and get some of her weight off (she is clocking in at 1,100 and only 15.1h!!!) Here’s hoping, right?! Going on that, I decided today she would be trotting under saddle. I got on without doing any longing so I didn’t tire her out before even attempting trotting under saddle. I decided to ride with my horsemanship flag as a “dressage whip” and to help bridge the gap between groundwork and riding. 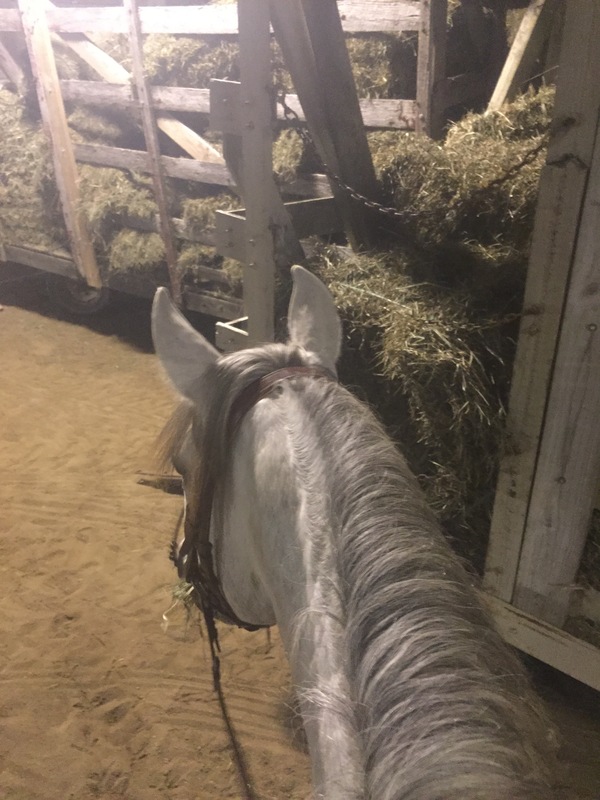 We have done so much horsemanship groundwork over the years and she is really sensitive (in a good way) about it that I thought she would feel comfortable if I can work her feet in the routine way of moving the hind, breaking over the front. It seemed to do the trick, because I started out with moving each hind leg, tapping her on the hindquarters with the flag. We played her new favorite game of “go forward means you stop and get a sugar”. She likes this game a lot and has it totally figured out after two attempts at going forward. Give me a few steps of trying and you get to stop and get a snack. Soon those steps are nice and enthusiastic and we are trotting nicely for a few steps and soon making it all the way around the arena. I even was able to maintain a trot while we changed directions across the diagonal, score! I got a couple minutes of video and called it good for today! Overall, very pleased with how she worked today. Catching up on rides number three and four with this blog post! I am most excited to say that Faith is going to be seeing the vet tomorrow afternoon to get started on her diagnosis process. Tomorrow will be her gait assessment to determine where the problem is coming from, whether that is from her back as it’s been theorized, her hips, or something else. I’m excited to hear what Dr. Thaler has to say! The EL2 “lameness locator” is a really cool process, with sensors attached to her poll, the top of her pelvis, and one fetlock. Then she will be put through a traditional flexion test so the sensors can capture and read the scientific information about the impact and push off phasesnof her gait. It takes the lameness exam from a subjective art of the vet’s eye to a combination of measurable results and expertise of what the vet is seeing. Although Faith hasn’t been lame in the traditional sense, it’s still a fantastic tool to gauge where the issue/s are coming from. From there, we’ll take the next step (something along the lines of ultrasound, x-rays, chiropractic, or injections to name a few) in a few weeks or whenever Faith’s owner is able to! I prefer this more expensive flexion test as it’s measurable and stored with the ability to pull previous tests up to compare results. When Atlas was first feeling slightly off two years ago, I chose to have Dr. Thaler out so I could get a definite answer and not just a “well, here’s my best guess today”. It showed that it was very minor (something that I feel because I had ridden him for a decade), and not in need of full out injections of the hocks and stifles at that time. What I appreciate most about Dr. Thaler and another reason I chose to use his services over MSU, is that I have personal and clients with experience of various diagnosis and treatment plans. He is very experienced, knowledgeable, yet offers a variety of treatments when it’s available that aren’t always “go big or go home” (aka spend every cent you have with no options). Like most horse owners on a budget, as much as I’d like to throw a thousand plus dollars into my horse at the slightest sign of a snuffle (kidding!!!) It just isn’t happening. I’m sure MSU’s diagnostic team would also be a fine route to take, but I feel more comfortable entrusting Faith to someone I already know. So, that being said, let’s get back to the second most exciting thing about this post: rides number two and three! I rode last week Thursday and Saturday. Faith has been looking stiffer and more unwilling to go forward on the longe line (no side reins used). Thursday was especially bottled up only tracking right, with some really weird moments between walk and trot that she looked like a gaited horse, yikes! The decision to hop on her was a little conflicted: was this pain related and would this set me back? I figured I’m really only on step 1 after starting at 0, so I didn’t have much to lose. If she acted out more than she had been, then I would immediately get off. I hopped on without any protests, and we had a great ride for about 15 minutes in the indoor. She was forward with really nice reach in her walk stride, not too much tension in her back, and overall really great! No grumpiness at all and we kept all four on the floor. Success! Being the adventurous person I am, I decided to push it one step further and take her outside. She loved walking on the trails before and my goal, once I know she is at least cleared to do light work, is to do as much outside the arena as possible. I’ve talked about that in her introductory post, so I won’t elaborate more here. We made it through the scary, horse-eating path from the indoor to the outdoor (past trailers, a truck, giant wood pile, a tarp covered wood splitter, etc). We walked around the outdoor calmly, going through the big lake sized puddle. When I decided to see if she would walk up the hill lane around the big pasture, she was feeling good but getting mentally tired I think. She decided to try “Plan B” of not working, which was to stop and back up. Not exactly wanting to encourage that behavior, my option to get her to stop backing without kicking her a bunch (potentially making her equate legs = punishment, not something I want to even suggest at this point), was to turn her left or right. This works great, but not when you’re in a 12′ wide lane with trees on one side and a hot tape fence on the other. I quickly gave up, not wanting to accidentally swing her into a fence. We headed back to the outdoor arena and I decided to walk her down the hay field out front along the driveway. Again, she was great until I was walking back to the barn. We got past her pasture and up to about the wash racks (maybe 100m from the barn) when she said “no thanks” and started the backing up thing again. Darn! She didn’t listen when I told her we were really only walking to the barn, apparently I need to bush up on fluency in horse. I got her going slightly forward and then hopped off and walked her in-hand back to the barn. Jayne’s mom, Diane, stopped out on Saturday to come meet her. I saddled up and decided to go straight to the outdoor before she got to Three Fillies. It was a gorgeous afternoon and I want to take advantage of every beautiful opportunity while I can! Faith unfortunately was really tight and gave me one pretty good buck shortly after I got on. After turning her in a one rein stop, I attempted to get her to walk back to the sand ring (we have no fence, just an open arena), but all she wanted to do was back, so I worked on the turning left or right. Diane arrived while I was stuck in a loop of left-right-stop. She brought two friends with her and they came over to say hello. This helped Faith quite a bit, for it got her focus off of going backwards and onto “ooh, hello new friends!” We were able to ride on the buckle and ride a lot of figure 8s before I finished up. She relaxed through her back (and brain), and had a lovely swingy walk in no time at all. I decided I won’t ride her again until after Tuesday. My parents came to the. Arm yesterday and we enjoyed a lot of time together just doing groundwork and scratching her. She loves to my scratched, especially on her hips, and will even try to groom me back. So sweet! Looking forward to starting on the road to some answers! Tonight Fidelia and I had a great breakthrough. This will be brief as I am whipped from being at three different barns today!!!! Ready to crawl into bed! I longed her again over ground poles, this time without a neck stretcher, before hopping on. Again, no sass during mounting and only once did she sass me the whole 15 minutes I was on tonight. That’s an excellent sign! I changed my approach to get her to start understanding that legs are good again. I am currently riding without stirrups (mostly just in case I need to do a quick eject, want to stay safe) and decided to let walking forward be her idea. I left my legs intentionally OFF her sides and praised the heck out of her when she took a step or two forward. She also got a ton of sugar cubes again tonight, which she thinks is the bees knees. Eventually I’m going to have a Cookie Monster on my hands but I’d SO choose that over a grumpy mare who doesn’t want to go forward. She also has been playing and fidgeting with the bit, particularly when I take contact. I don’t think it’s a sign of pain (trust me, I’m watching every inch of her for any microscopic change), but just impatience and made worse by sugars. So, instead of picking that battle right now, I rode on the buckle and made very light but clear signals for her to turn right or left. Halting is a piece of cake off the seat. She has always been sensitive to seat aids and now just going walk to halt is absolutely no problem. We walked several times the length of the arena, walking over the ground poles I had out, and down to the hay wagons on the far end (stuffed full of third cutting grass hay). I used the hay wagons as a good incentive, allowing her to grab a bite of hay when she got down there. I’m not above using food as a distractor until she is more confident and happy in riding again. My goal is to get her out on the “trail” of riding around the hay field by the end of the week. She LOVED trail riding before, so I think the more I can do the sooner in the restart process, the happier she will be! Look at that cute face I got after her workout tonight – she was pretty pleased with herself!